This 2-month journey was about bearing witness to and immersing in the profound living goddess traditions of India — traditions that are dynamic and still growing, and that have influenced every aspect of Indian thought on the subcontinent and beyond. In two months we visited 41 major goddess temples, dozens of ancillary temples, and countless village shrines, each of which has a place within the cosmological framework of Indian tradition, each of which rings with a particular vibration. Each of these places are not just places on the external map. They are places within us. They have a sound and a location within the sacred geography of the body. The ‘pilgrimage’ is then ultimately the act of going inward and finding her there, in the heart, in the eyes, in the hidden hollows and springs, in the gentle white slopes of the sacrum, where she’s been sleeping all along. This trip felt timely. 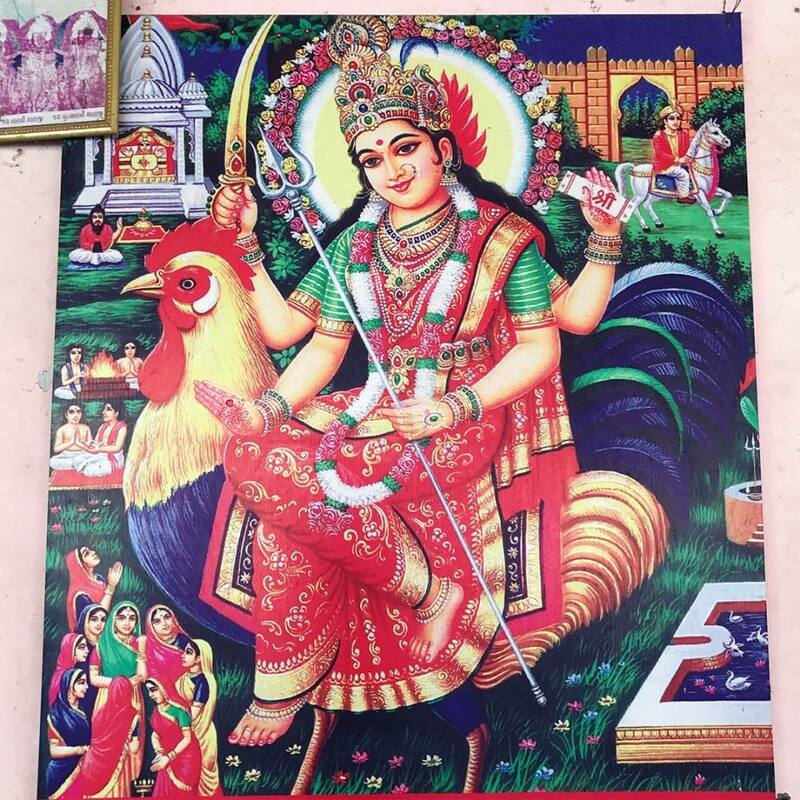 At a time when women around the world are raising their voices and speaking the truth about sexual abuse and oppression at the hands of men and simultaneously the ugliness that women have always faced is on full display from those in the highest positions of power, it felt fitting to do a goddess pilgrimage. It felt fitting to infuse the internet with images of wild-haired yoginis and Kālī’s protruding tongue. The Tantric temples of Orissa are adorned with images of women — how shall we say — unashamed, fierce-eyed, squatting, unabashed, unshaved. The village goddesses in rural India are sometimes no more than primal heaps of red mud swathed in flowers, slathered in butter. I’d like to take that mud, those flowers, that butter, and dump it all over the current social media diatribe. Somehow, I feel that means something. We live, in many ways, in a culture of boxes. We inhabit boxes. We wake up and drive in smaller boxes — on square and empty streets — to another box where we work. Usually our work involves staring at a square screen in a box within a box. This cultural geography effects all of us, left or right. It effects the words we use, the thoughts we have, the boundaries of our consciousness. When our cultural discourse gets so boxed, polarized, riddled in repetitive vernacular, it is powerful to remember other shapes, patterns, movements, sounds, stories, whispers, hums. The goddess traditions hit at colors and currents that offer a different artistic, social, and cosmic geography. Heaps of mud. Piercing eyes within golden eggs. Bleeding fissures in ancient stones. Flames and yellow oil. Ululating cries. 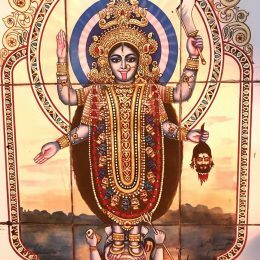 As much as the goddess traditions of India honor the maternal aspects of the universe, it is important to remember that goddess worship within a culture does not in any way ensure or equal gender equality. Paradoxically India — with its vibrant traditions that offer such detailed depictions of feminine power — also faces tremendous issues around gender inequality, sexual abuse, and spousal abuse. Feminist scholars have written about this paradox at length. This too, is part of her story and part of her relevance. We don’t know how the village goddess cultures of the subcontinent used to be, back before they were absorbed and reshaped by larger empires. 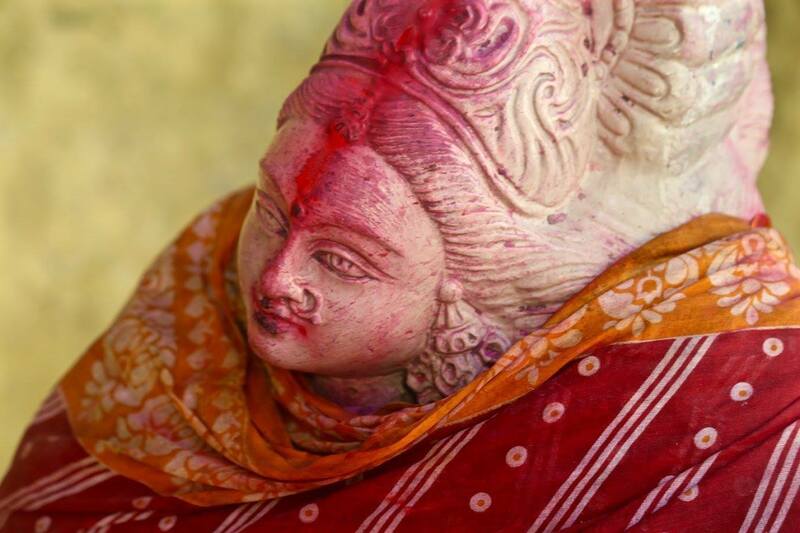 We do know that within the history of the mother goddess traditions in India we see women’s uprisings, social justice movements, ancient offshoot sects that were clear attempts to correct the place of women within Indian society. We can also see how these attempts were re-appropriated back into the male-dominated fold, time and time again. We see the larger horrors of the caste system, and we see goddess traditions that re-recognized and sought to treat all people within society as sacred. 1,600 years ago the Devi Mahatmya offers a clinic on how men objectify, vilify, patronize, and underestimate women. The Tantric movement to re-include widows and street-sweepers and chalk dealers and butchers and low-caste tribal girls was nothing short of a revolution. Until the revolution itself was co-opted, yet again. On a socio-cultural level, the types of issues addressed in the ancient goddess tales have timeless relevance. She’s been equally shunned and objectified, vilified and glamorized, outcaste and worshipped, all of it, over thousands upon thousands of years. Within the larger sacred landscape, the goddess traditions offer ways to better understand the vibrational energetics of nature, the artistry of the cosmos, and the nature of consciousness. Although her story is deeply tied with gender, she is beyond gender. Ultimately, when we speak of the goddess we are speaking of the vibrational power of the universe, of consciousness itself. Nothing short of this. It has been a gift over the last 2 months to be able to visit such sacred places, inside and out. Hopefully it provides inspiration and benefit. Hopefully it helps us remember that there are different archetypes available to us. Streams and rocks and trees are to be honored. Make a pile of mud and light a candle to it. Touch dirt. Why not? Sing hymns to black holes and gravitational waves. Sound is a gateway. Candle flame can help us. Vibration surrounds us. Honoring nature matters. She is art. She is alive. She has, of course, thousands upon thousands of names. I close this in gratitude, by invoking one of them. It’s a rare one. It makes an appearance in a very old story — a story that recounts her journey, her separation from herself, and her pilgrimage of reunification, which is the pilgrimage each of us take, every day, with each breath. To you, the tamarind tree in the center of the moon. You are the bend in the breeze. All that I sought, all that I longed for, all those days. I read this article and found it very interesting, thought it might be something for you. The article is called Exploring the Shakti Traditions of India and is located at http://taptamarg.com/exploring-the-shakti-traditions-of-india/.